Now a new exhibition at the British Museum will disclose the human side of the mummies of the Nile. Eight have been – scientifically speaking – stripped bare revealing secrets taken to the grave thousands of years ago. 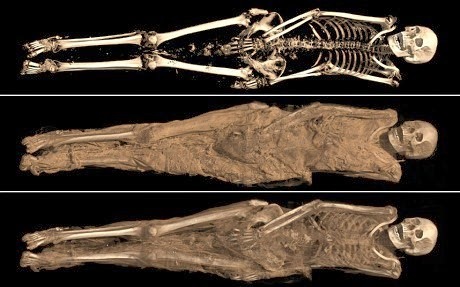 Subjecting the corpses to the most advanced scientific techniques, including sending the mummies to hospitals around London for CAT scans – the museum’s Egyptologists have been able to build up the most detailed picture yet of what lies beneath the sarcophagi and bandage-wrapped bodies. The exhibition called Ancient Lives: New Discoveries, which opens in May, will show mummies in a new – and often ordinary – light. The new analysis has unearthed evidence that, just like modern man, ancient Egyptians suffered from high cholesterol and agonising toothache. They even had tattoos. The exhibition is likely to be one of the most successful ever staged by the British Museum and follows in a fine tradition of blockbuster displays based on archaeological finds from ancient Egypt. The Treasures of Tutankhamun, staged at the museum in 1972, attracted more than 1.6 million visitors. The new exhibition looks at those living along the ancient Nile from royalty to more ordinary inhabitants. 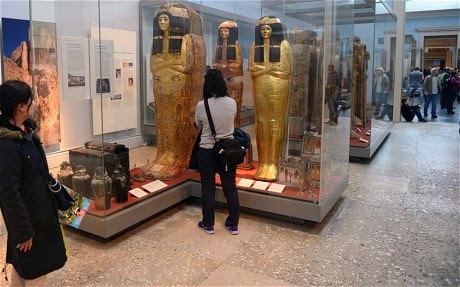 Mummification, the curators are keen to point out, was not the sole preserve (pardon the pun) of pharaohs. Curators have deliberately chosen mummies from different eras and different backgrounds to cast them in a new light. The oldest of the mummies to undergo scientific testing is more than 5,500 years old and dates back to 3,500 BC. The most recent example is a female aged between 20 and 35, who lived about 1,300 years ago. The mummies range in ages from two years at the moment of death to 50. Some were discovered by explorers more than 100 years ago while others were found as recently as 2005 on the banks of the Nile in what is now Sudan. Over the course of several months, the mummies were taken at night to hospitals and subjected to scans normally reserved for living patients. CAT scans – or computed tomography to give it its technical term – generate three-dimensional images of patients’ organs, bones and tissue using X-ray technology. Some of the mummies were so well preserved that the scans revealed parts of the brain and other vital organs still intact. The CAT scan images of the mummies were then combined with other forensic detective work, such as infra-red “reflectography” and carbon dating, to build up a picture of ancient lives. “What we are doing in the exhibition is investigating the lives of eight people from the past,” said John Taylor, head curator in the Ancient Egypt and Sudan department at the museum. Dr Taylor said: “We took the mummies to hospitals mainly around London. We used the facilities after hours. We used a sophisticated dual energy scanner that gave us X-rays of different layers. CAT scans of the pelvic area enabled the team to age the corpses, based on wear and tear of the bones. The scans also showed how the ancient inhabitants of the Nile suffered from heart disease and toothache. Two of the eight mummies appeared to have suffered from heart problems. The two mummies were found to have suffered from plaque in their legs. Plaque is made up of cholesterol, calcium and tissue and as it builds up arteries narrow. Daniel Antoine, the museum’s curator of physical anthropology and curator of the coming exhibition, said: “The scans showed two of them with plaque in the leg. “That is an indication of cardiovascular disease that can lead to a heart attack or stroke. This might have been caused by lifestyle which means a diet rich in fat or it might be genetic. The other major find was that the majority of adults had terrible dental health. They had huge abscesses. The ancient Egyptians ate a varied diet that included fish, a little meat, beer, bread and sugar-rich fruits such as dates. The scientists at the British Museum even studied bread found with the remains of the mummies to see if it had a high content of abrasive sand that might have contributed to tooth decay – it didn’t. The woman was about 5ft 2in tall and was found in 2005 on an archaeological dig in a cemetery in Sudan. Other ancient Egyptians who were mummified had their organs removed before being preserved. 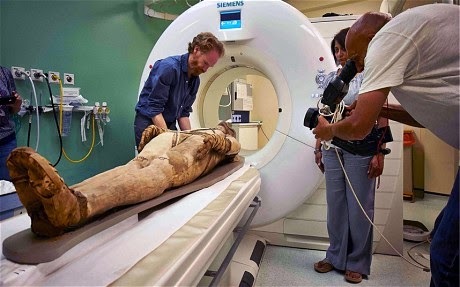 The Sudanese mummy will go on public display for the first time in May. Each day thousands of people will see her tattoo. 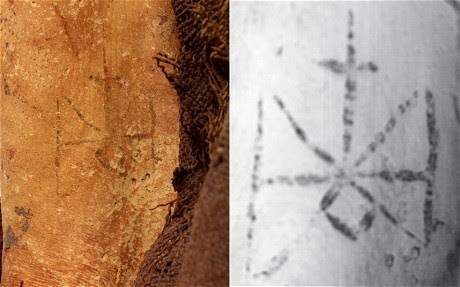 It is not clear who did the tattoo in ancient Sudan, and whether it was visible to other natives. High up on her inner thigh, it may or may not have been out of view. And for all its scientific expertise, the British Museum admits to being unclear as to what exactly was the fashionable length of skirt worn by an ordinary Nile dwelling female in AD 700.